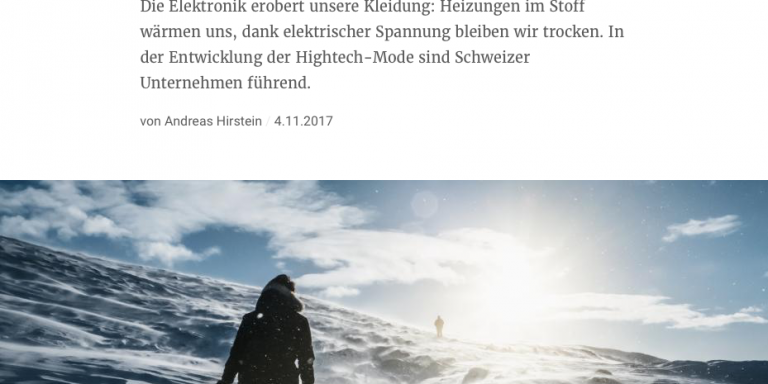 In the highly respected and well read NZZ am Sonntag (NZZaS), the journalist Andreas Hirstein writes a very interesting article about the future of high-tech fashion. HYDRO_BOT and our partner, Schoeller, are amongst those featured in the article. Here we publish a translation of the article with the permission of NZZ. The original full article in German can be seen here. The electronics conquer our clothes: heaters in the fabric warm us, thanks to electrical voltage we stay dry. Swiss companies are leaders in the development of high-tech fashion. Survival in the vicinity of the Arctic Circle: It is clothing that enables people to settle in almost all climates. Clothes make the man. But that’s by far not all. One could say that clothes actually make humans. We use clothes to express grief or joy, to demonstrate power or influence, or to convey affiliation to a social group. In our culture, clothes have a function. But the real purpose of clothing is far more basic and often forgotten, when we only think of clothes in the context of fashion: clothing enables us to survive. Our species could hardly survive anywhere on our planet if textiles wouldn’t protect us from freezing cold or burning heat. No other animal is as helplessly exposed to the elements as naked humans, and yet they have spread the world from the equator to the poles. Clothing is therefore always functional, and even after tens of thousands of years of textile history human ingenuity is not exhausted. Engineers are still finding new materials and cloths in order to better protect people’s temperature-sensitive bodies. And often companies from Switzerland are at the forefront of technical developments. Cheap everyday clothes originate from Asia, Africa and Eastern Europe; However, high-tech textiles are produced in this country, where the technical and scientific know-how is available and high labor costs enforce innovations. While the use of textiles has been improved in the past mainly by chemical methods, today our clothing is increasingly conquered by electronics. At the touch of a button, drop after drop appears on the cloth. One of the most spectacular inventions of recent years comes from the Swiss company Osmotex in Thalwil. The engineers around the Norwegian Trond Heldal have developed a microporous membrane that repels rain, but directs water vapor to the outside. This promise is already known from materials such as Gore-Tex and Sympatex. How well it works in the case of the Osmotex membrane can be followed in the laboratory with the naked eye. At the touch of a button, one drop of water on the fabric grows one after the other. The liquid is literally pumped up from an underlying reservoir. “Currently available membranes can transport several liters of moisture per hour and square meter,” explains Trond Heldal. “Assuming relative humidity is 0 percent outside and 100 percent in clothing, as is the case in standard lab tests.” But in humid climates or at low temperatures, today’s membranes often work poorly or not at all, says Trond Heldal. The membrane from Thalwil, however, pumps up to 200 liters per square meter per hour. “This is far more than a person can sweat even at a maximum physical effort,” explains Trond Heldal. The Osmotex membrane – marketed under the name Hydrobot – is based on the physical effect of electro-osmosis: a small electrical voltage is applied between the outside and the inside of the membrane and causes the ions that are dissolved in the sweat are transported through the pores of the membrane to the outside. Therefore, the membrane must be provided with an electrically conductive layer on both sides. To illustrate the process, Trond Heldal places the membrane under a microscope. “We use a textile material, which is interwoven with conductive fibers.” The required voltage of only 0.5 Volt is delivered by a small battery. It should provide energy for an eight-hour operation. In the future, the membrane can also be controlled wirelessly via a smartphone app. Hydrobot will be available in retail as of next year. It is marketed by the sportswear manufacturer Kjus base in Hünenberg, a company founded by the former Norwegian ski racer Lasse Kjus. There are several reasons that Hydrobot will initially be used in a ski jacket. On the one hand, there are solvent customers in this market, on the other hand, ski jackets are not worn daily and therefore rarely need to be washed. Because washing is a sticking point: the marketer Kjus requires that the membrane survives five washes unscathed. By comparison, 30 washes are the industry standard for softshell jackets today, and underwear has to sustain hundreds of spin cycles – a target Hydrobot would not yet achieve. That could change though. The developers want to further improve the membrane in order to enter other fields of application as well. The Hydrobot membrane will be produced by Schoeller Textil in Sevelen (SG) as of the first quarter 2018. Siegfried Winkelbeiner, originally from Bavaria, has been managing the firm from Eastern Switzerland for past five years by now. For him, Hydrobot is a step towards the fully air-conditioned ski jacket. “If you also integrate electrical heating functions in the jackets, you can control both the temperature and the humidity,” says Winkelbeiner. Projects with heatable textiles are currently running with various international clothing brands. The right temperature is important for the comfort of the garment and for the wearer’s performance. The fabrics do not need to be as thick and uncomfortable as ordinary winter wear. Of course, the energy supply remains a challenge. While the Hydrobot membrane consumes an average of one watt, an electric heater absorbs at least ten times the energy from the batteries. Nevertheless, Winkelbeiner believes in the future of electrical functions. “The time is ripe,” he says. “We have the necessary materials and processing techniques.” And batteries would become cheaper and better. In high-performance sports, the body sometimes needs more energy to cool the muscles than to run or cycle. Considerable technical effort is required for modern textiles. As so-called homoeothermic animals, humans depend on a constant body temperature, no matter whether we trudge through the Antarctic or sit in the sauna. And no matter whether our metabolism bobs around at 80 watts or if we burn 1000 watts with strenuous activities and our muscles produce more heat than do mechanical work. If this is not enough, the body eventually reduces blood supply to the muscles. This could be observed in 1984 at the Olympic Games in Los Angeles, as the Swiss marathon runner Gaby Andersen-Schiess staggered through the finish line and collapsed. She had missed in the competition the last beverage supply, whereupon her body could not produce enough sweat. At the finish the doctors measured a body temperature of 41 degrees. The production of sweat is vital in case of great heat and physical exertion. “A person’s sweat glands can produce one liter of liquid per hour,” says René Rossi. “In extreme situations, the value can temporarily rise to just three to four liters.” For clothing to support the cooling effect of evaporating sweat, it must be close to the body and thin. Only then the evaporation heat is removed directly from the body surface and not just from the surrounding air. Fluttering clothes would only protect against direct sunlight, but the evaporation effect would fizzle out. That’s why footballers’ jerseys are now leaner and thinner than they were years ago and why they’re tearing faster, like the Swiss Nati shirts at the European Football Championships in France. However, textile engineers are also working on new chemical and physical methods to improve the heat regulation and moisture transport of clothing. An example of this is Coldblack, a wash-resistant finishing of the fabrics. It protects against dangerous UV light and prevents dark textiles from heating up in the sun. Specialized molecules in the equipment absorb sunlight, and instead of warming up, they release the energy as invisible infrared radiation. The black-clad traffic police in San Francisco carry these kind of clothes. The thermal comfort of clothing can also be increased by means of phase change materials. Small, paraffin-filled microcapsules are used inside the fabric. When the temperature rises, the paraffin changes from a solid to a liquid state and absorbs heat energy. For this reason, the temperature initially does not rise any further – like ice cubes keep a drink’s temperature at constant level. If, on the other hand, it gets cold, the paraffin solidifies; it releases heat energy and delays the cooling process. Thermal imaging: In the red and white areas, the body loses heat. Even the water permeability of modern textiles can today react flexibly to the ambient temperature. Schöller’s new “C-Change”, for example, opens its pores at 20 degrees, allowing water vapor to escape to the outside. At 10 degrees, however, the pores are closed, which means less heat is lost. Functional clothing ensures that our body does not overheat, yet, the clothing also has to protect us from losing of body heat when it is cold outside. To achieve this, the textile fiber has to be a poor heat conductor. Natural fibers like wool and cotton meet this condition as well as the usual chemical fibers of the textile industry. An even better insulator is, however, air enclosed in lined clothing. Down and other filling materials are necessary to prevent air circulation within the air chambers and thus reduce the heat loss between the lining and the outer skin of the clothing. But good heat insulation also requires effective moisture regulation. It is not only unpleasant for the wearer, If the clothes get wet through rain or sweat. It also destroys the heat-insulating properties of clothing, because water conducts heat 25 times better than air. This is the reason why breathable membranes can be useful, especially in winter clothing. However, natural fibers sometimes have advantages as well. “What kind of materials performs best depends on the intensity of the physical activity,” says Thomas Bechtold, professor at the Institute of Textile Chemistry and Textile Physics in Dornbirn. For example, when hiking, natural fibers are often are to be preferred because the biomolecules are hygroscopic. This means that they bind water molecules and trap them inside the fibers. In moderate sports, woolen clothing feels dry and does not stink. That’s because water molecules have no contact with oxygen in the fibers, a precondition to start the metabolism of the odor-causing bacteria. “A component that costs 50 francs in purchasing leads to a price increase of 500 francs in the shop”. Not every technique is therefore likely to prevail in practice, believes Jan Zimmermann, Head of Textile Innovation Development at the embroidery company Forster Rohner in St. Gallen. New technologies can face a hard time in the textile industry because they cannot be integrated simply into existing production and the service of electronic components can be difficult. “The Shipment of batteries alone can be a hurdle,” explains Jan Zimmermann. Another problem is the value chains that can make an electronic component unaffordable to the end user. “A component that is procured for 50 francs triggers a price increase of 500 francs in the shop,” says Zimmermann. Because every middleman adds the usual profit margin for the product. The company Forster Rohner tries to reduce its high product development costs by standardized heating elements, which are suitable for all clothing sizes. The products Zimmermann displays in front of him showcase the principle: The dark carrier material on which the thin metal wires run in serpentine lines can be separated along pre-drawn lines. Like an accordion, the heating element can then be pulled apart and adapted to all common clothing sizes. The heating elements are currently available in three power levels , varying between 8 and 34 watts. Today, the technology can be found on the market in winter jackets from luxury brands such as Bogner and Zegna. The heating wires hidden in the lining are visually copied as a picture on the inner lining of the jacket In that way the customer can sees what an expensive piece of technology he has purchased. After all, the high-tech jacket does not only have perform practical functions. Clothes are known to make men.